The Earth is like a peach. 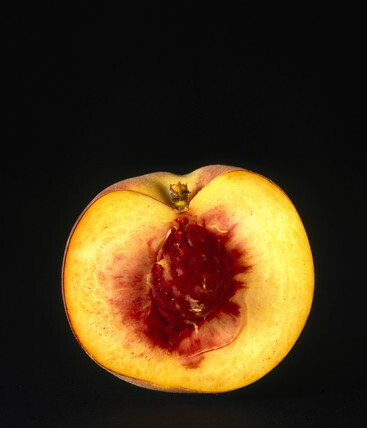 The fuzzy exterior of a peach at that scale represents quite nicely the hills and valleys of the planet, as does the non-perfect spherical shape. (The Earth is not actually a sphere but bulges slightly at the equator). The crust of the Earth is broken into tectonic plates not one perfect, connected skin. The stone, while a good rough analogue for the diameter of the core, doesn’t illustrate that the core is made up of a liquid outer and solid inner core. It also doesn’t show the correct temperature, pressure and phase boundaries but then that’s just splitting hairs. What can someone really expect for comparing fruit to the entire Earth! So there we go, next like you eat a delicious peach you can contemplate its beautiful similarity to the layers inside the Earth.